Go through the article to know the step by step procedure on installing Ubuntu operating system in your PC. Once you download Ubuntu operating system iso image, there are two different ways to install it. First one is the traditional way ie., by burning the iso image into a CD or DVD and the second procedure is installing the Ubuntu operating system through a USB stick. In this article I will explain the procedure on how to install Ubuntu operating system through a USB stick. 1) After downloading Ubuntu operating system one should download a software called Universal USB Installer for installing Ubuntu on a USB stick. 2)To download Universal USB Installer you should visit the site PenDriveLinux.com and you should download the software. 3) After downloading the "Universal USB Installer" open the software and select the operating system which you want to install in your USB. 4) After selecting the operating system one should click on the browse button and select the location where the iso image of Ubuntu is located. 5) Now we should select the drive letter of the USB. 6) One should take proper care while selecting the drive letter of USB. 7) Once the drive letter is selected you should click on create. 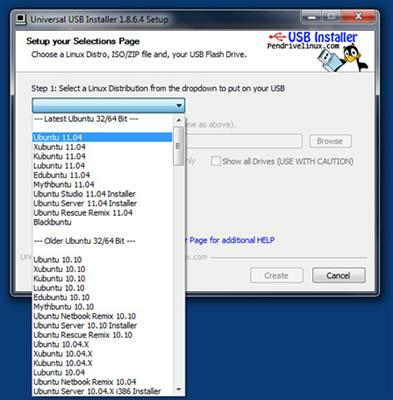 8) Once create button is clicked, Universal USB Installer will starts installing Ubuntu OS on your USB stick. 9) After installing you should restart the system. 10) one should change the boot order to "Boot through USB" by pressing the f2 key while the system is booting. 11) Once the system start's booting from USB you can find various options and you should follow the on screen instructions to install Ubuntu operating system on their PC.